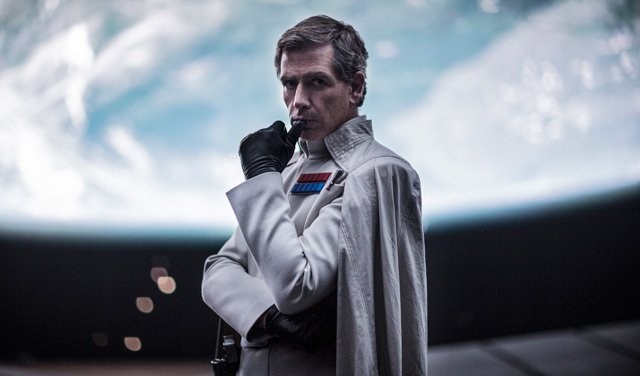 OK, I have to admit that before Rogue One, I hadn’t heard of Ben Mendelsohn. The Australian actor is well known Down Under and has starred in many notable films, but he wasn’t exactly on the radar of American audiences. Despite that, he’s been in many films that Americans will recognize. He’s been in The Dark Knight Rises, Vertical Limit, Australia, Animal Kingdom, and more. But he’ll soon tackle his biggest role yet as Director Orson Krennic in Rogue One and is quickly following that with another role in Steven Spielberg’s upcoming film Ready Player One. I spoke with Ben at the Rogue One press junket and found him to be kind, enthusiastic, extremely animated, a geek at heart, and a Star Wars fan just like any other. ComingSoon.net: We chatted yesterday on video, and I was amazed to hear what a “Star Wars” fan you were. You’re kind of the same generation as I. We grew up with it. CS: Did you have the toys and all of that? Mendelsohn: Oh yeah, yeah, and I bought the album. And I loved the artwork. I loved the photographs in the album. The trading cards that I had, and they are the ones to me that were the most precious, because you’d have to buy them piecemeal and you’d have to hope that you got some new ones. And I still remember the rarest one that I had, that I found a copy of one day, that was Han and Chewie sort of firing, you know, one blaster and, “Yaahhhh!”…the whole thing. Yeah, I really am a fan of it first, and for a long time. CS: So what is it like when you go on the film and everybody’s like a real fan of it? Does that change the atmosphere on the set? Mendelsohn: It makes it quite joyous. It adds a certain joyous dimension to it. You know, what I think we were very, very conscious of was not wanting to turn it into some sort of hall of mirrors, sort of echo chamber to lessen it. I think because there were so many fans, there was a real canonical kind of dedication to it, in a way. You know, it was sort of like trying to be a faithful disciple to it. But there was a lot of joy. Everyone on Fridays, everyone would wear their “Star Wars,” some “Star Wars” things, or it was “Star Wars” day and people would come in with their “Star Wars” T-shirts or their “Star Wars” whatever. And there was an astonishing variety of stuff. That was every Friday was “Star Wars” day. And so, everyone could turn up in whatever. We were in our costumes. CS: Well, I’d like to talk a little bit about your character. CS: So where does he fit in the chain of command with Tarkin, who we saw in “A New Hope”? Mendelsohn: Absolutely. Tarkin ranks him. Tarkin ranks him, but sort of tangentially. He’s not straight above him, in his way, but he does rank him. And Tarkin, yeah, Tarkin, he ranks him there. CS: Is there some friction between the two? Mendelsohn: Well, I couldn’t comment on whether or not there was any friction between him or anyone else that we don’t really know about at this point. CS: All right, it was worth a try. Mendelsohn: But it was a very good try. It was a very, very good try. CS: I noticed in “A New Hope” some of the other Imperial leaders have no problem telling off Darth Vader. CS: And that kind of disappears, I guess as he kills them all. CS: But your character, it seems from the trailer, has no problem facing Vader head on? Do we see some of that? 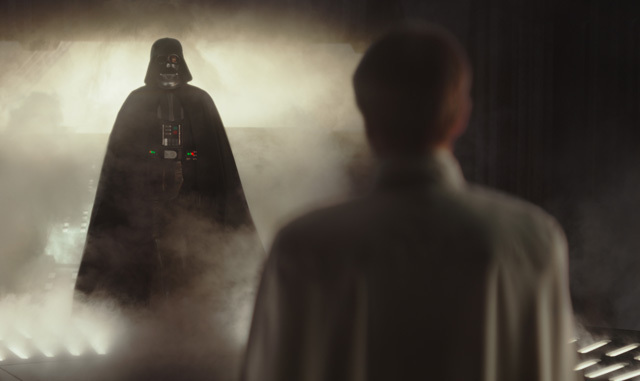 Mendelsohn: Well, I think we’re going to learn – look, Vader’s very, very formidable. And I think that Vader kind of like, has his own sort of sphere, he’s got his little place. I’m trying to thread this needle so delicately. You can’t dismiss Vader. I think that Krennic believes in more like the traditional American doctrine of overwhelming force, the grand doctrine of we’re going to win by force. But he’s not to be trifled with. But I think he considers him more like the pet of the Emperor. And there is a bit of an eye roll and whatnot, but they don’t mistake his one-on-one fighting prowess. CS: Right. In the clip we saw at Skywalker Ranch, your confrontation with Galen, [Krennic is] very sarcastic, it seems. Is that one of his characteristics? Mendelsohn: Well, I think with Galen, they’ve known each other so long. And I think he regards – because they came up together and stuff like that. And I think he regards Galen as a really brilliant, hopeless alcoholic, as it were, just a guy that is absolutely brilliant, but just completely, a lost cause. He’s lost to a true belief in this thing. Now, I’ve tried with this guy and I’ve tried with this guy and I’ve tried, and he’s a friend of mine, but he is just a waste of time, ultimately, except when I need him. CS: Now there was a “Star Wars” prequel book, “Catalyst,” that got a lot into Krennic and Galen’s relationship. Have you had a chance to look at that? Mendelsohn: No, no. So in fact, I only learned about it yesterday. Mendelsohn: Yeah. Yesterday was the first time we learned about it. So we spoke a lot about – well, in fact, you used to be able to get a Death Star manual with a whole different back story to it. So I imagine that this will now become the official – well, it is now, this is the official canonical, as it were, version, but there were versions and tellings of the Death Star that were different. In fact, that was my crew present for everyone. I bought them the Death Star manual, and I signed it and thanked – I bought, I don’t know, 50 or 60 of them, because I knew they were going to be gone. They weren’t going to be making those after this came out. They would be gone. CS: And you just wrapped on it recently? Mendelsohn: Yeah, although I haven’t wrapped wrapped. They’re still ticking along. But certainly, the majority of it, the vast majority of if, we’ve done. CS: What’s it like working with Steven Spielberg? Mendelsohn: Oh man, yeah, it’s really exciting. It’s very, very unexpected. He is so many things you don’t expect. You expect he’s going to be a bit more like a Krennic, you know, he’s going to be a very much a top down thinker and I’m up here and you do that and do that. You expect an authoritarian, and he’s not. He’s a genuinely passionate collaborator. He is nimble and thinks on his feet all the time and has all these incredible, fluid…. You know, his camera work is really like, extraordinary. And so, as an actor, trying to make that dance work, where you come together and you try to dance together with the camera to hit the right points, and that’s a whole, yeah, that’s a very different skill set. And when you get it right or when it works, he’s absolutely delighted. He’s over the – “Yes! That’s a big movie moment!” And he’s incredibly knowledgeable and a gentle person, too, a really gentle, fair person. CS: Now you were a child of the ’70s and ’80s. CS: You appreciate all the references in the story. Mendelsohn: Oh yeah, and I love it. And I mean, look, it’s gorgeous to be able to do “Ready Player One” with its wealth of self-referencing to all of that period, and I think there’s no one happier than Eric. I mean, it’s just like, wow, Spielberg’s making my film. But and in a way, he is, of course, the most perfect and obvious and dream candidate for that, because he gets it. I mean, no one gets it like he gets it. And it does seem to be coming at this point in culture, with the Netflix “Stranger Things”, etc., etc., there does seem to really be coming to this point, where all of that stream of stuff is really forefront of the pop culture mind. So knock on wood for that one. CS: Your face is on all these products all over the place. CS: Do you have a favorite particular one? Mendelsohn: Well, look, honestly, I haven’t seen a lot of them. 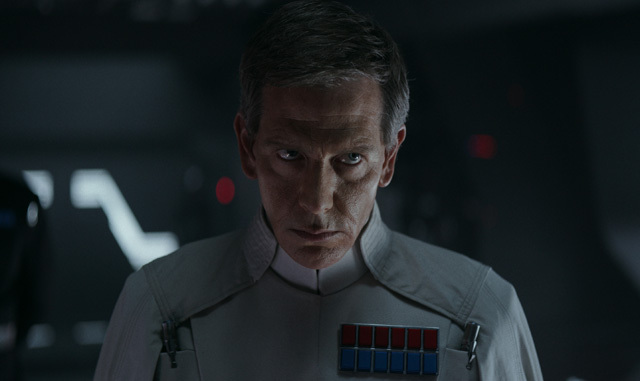 Mendelsohn: Even the full-size Krennic [figure], but I think the socks. Mendelsohn: The socks seem to be a favorite of a good deal of people. And until I know better, I’ll go with the socks. CS: Maybe the Hot Wheels. 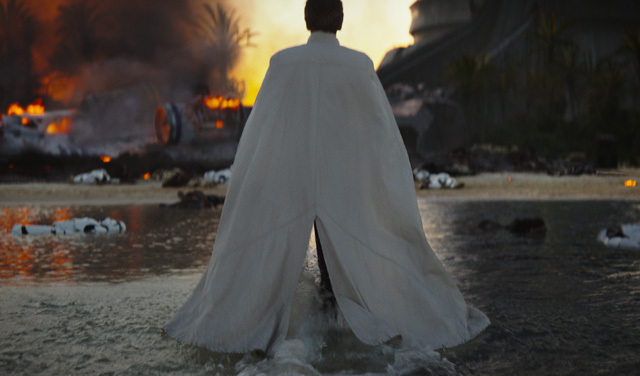 Mendelsohn: I haven’t seen the Krennic Hot Wheels. CS: There’ll be one, eventually. Mendelsohn: Yeah, no, no, and I love the Hot Wheels crossover, because they’re sort of like, oh yeah. CS: Yeah, who would’ve thought? Mendelsohn: But I also, I’ve got to say, I do love the LEGO, Krennic’s Imperial Ship. Mendelsohn: Because personally, for mine, I think Krennic’s ship is the coolest, outside of the Millennium Falcon. CS: Are they doing a LEGO video game of “Rogue One”? Mendelsohn: I’m not sure. I couldn’t tell you that one way or the other. I mean, I would be kind of surprised if they didn’t in some way, but you know, not massively. CS: Maybe you’ll get to do the voice. CS: Harrison Ford did it. He did a LEGO Han Solo. Mendelsohn: Yeah, yeah, no, no, no, I think they’ve done extraordinary – I mean, I think the LEGO games are awesome. I mean, they’ve done great with that. And look, I love LEGO. I’m also a child of LEGO, so we all are. So go LEGO. The Walt Disney Studios and Lucasfilm will release Rogue One: A Star Wars Story in theaters on December 16.